There is something almost magical that happens when an organization clarifies and embraces its purpose. It is something that may be most dramatically seen with our team members, affecting everything from recruiting to retention to productivity. Ultimately, it leads to results that having an eye-opening effect on the bottom-line success of an organization. Attracting talent is one of the areas where the power of purpose really becomes evident. As one report from Deloitte revealed, “Overall, 60 percent of the Millennials we surveyed say a ‘sense of purpose’ is part of the reason they chose to work for their current employer." This is just one of many studies that continue to illustrate a growing desire among recruits in today’s market. But what’s even more intriguing are findings that demonstrate purpose is going beyond being a preference to becoming a prerequisite for some. A study from Rutgers University spelled out the significance of this by reporting, “Over half — 58 percent — say they are willing to accept less pay in order to work for an organization that shares their values, and 45 percent say they would give up 15 percent to have a job that seeks to make a social or environmental difference in the world." Recruits are telling us that purpose is important to them. And they’re willing to put their money where their mouth is. I often talk about purpose having a certain magnetic quality that attracts the best candidates. But it is a magnetism that goes beyond attracting to ensuring that talent sticks with our organization. As another report noted, “…purpose-driven employees have 20 percent longer expected tenures, are 47 percent more likely to act as ambassadors for the organization, and are 64 percent more likely to be fulfilled in their work." Promoting purpose creates a sense of meaningfulness in our work. 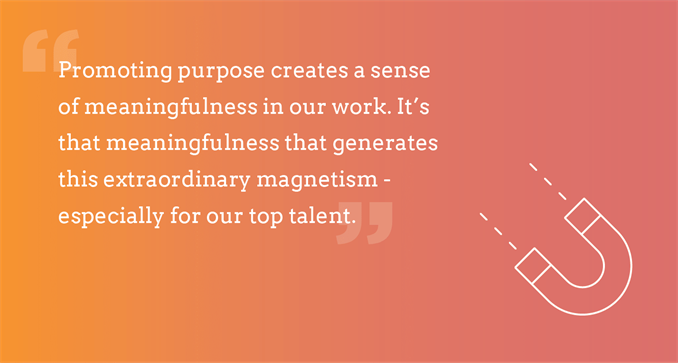 It’s that meaningfulness that generates this extraordinary magnetism - especially for our top talent. It should come as no surprise that team members that are drawn to a purpose-driven organization also end up being more productive than their counterparts in less purposeful organizations. It just makes sense. A purpose-driven environment leads to more highly-engaged employees. And highly-engaged employees are more productive employees. As an example, “A recent study found that when employees feel they’re working toward a good cause, they are 30 percent more productive." Of course, co-opting purpose to solely drive more productivity won’t work. Team members have a keen sense for that kind of inauthentic manipulation. The productivity is a rewarding byproduct that will emerge when we engage people in work where they genuinely feel they are making a difference for those around them. There are many reasons to embrace a purpose within an organization. But the bottom line is the bottom line. And this is where purpose excels. According to a study from Deloitte, “91% of respondents (executives and employees) who said their company had a strong sense of purpose also said their company had a history of strong financial performance." This is one of the many findings that continue to surface, helping us all understand how purpose is driving success across all divisions and departments. It is undeniable how it has become a decision driver and an impact issue for our people. Which means it has become an impact issue for the whole organization. By powering recruiting, retention, and productivity with purpose, it’s an impact that we can nurture to ripple out all the way to the bottom line.